Daniel Barker LDS Author: In Line for . . . In Line for . . . 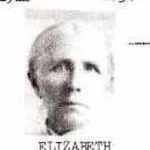 Prior to Elizabeth Daniels Casto joining the Church in England in 1841, she was in line for what? Pioneer Women of Faith and Fortitude, Daughters of Utah Pioneers: (International Society Daughters of Utah Pioneers: 1998), 1:440.